A chaotic marketplace can make settling on a purchase so difficult that you leave Amsterdam's Red Light District entirely and just go get high. Well, you're on your own there. 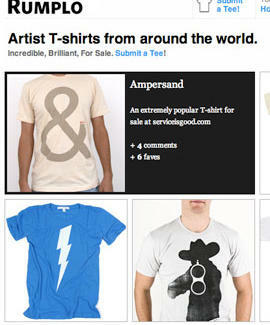 But for t-shirt shopping made easier, try Rumplo. Rumplo collates shirts from hundreds of indie designers (plus select bigger operations) to build a massive yet manageable database of tees -- an idea that could only be conceived in Brooklyn, birthplace of industrious slackers. Casual shoppers can narrow down the trove by searching by keyword and color; tee-fetishists can create a profile, then subscribe to specific designers and get RSS notifications when they release a new design -- like stalking someone whose only interest is in you not being naked (y'know, like regular stalking). As for range, Rumplo has everything from TimberEps' ax-wielding lumberjacks, to Anonymous Venice's shotgun-toting cowboy silhouettes, to Whitehorse -- but not Whitesnake, because they're just too damn busy to make t-shirts. Rumplo will soon begin delivering designer updates via email -- so even if you're sitting bleary and dejected in an Amsterdam cafe, you'll know somebody's still got you covered.